Decorative return air filter grilles are functional in addition to being beautiful. These return vents are handcrafted in the USA with quality 18 gauge steel. Decorative return air filter grilles are available in 15 different scratch resistant powder coat finishes. Your stylish new return vents include all mounting hardware and a reusable black filter. 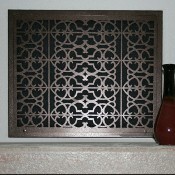 Decorative return air filter grilles come in your choice of 28 designer patterns. 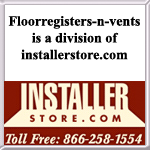 These filtered return vents have a 1/4" turnback and will insert into the hole 1.5" to 1.75". Your decorative return air filter grille is easily screw mounted to the wall. Once the filter is inserted, just screw on the door know and enjoy your new piece of art. Changing the filter is a breeze with the screw on door knob. Please note all sizes are listed width by height. Decorative return air filter grille recesses into wall 1.5" to 1.75"
Tip: To order the correct size, measure your hole and order that size grille. For example a 10" x 10" hole will need a 10" x 10" grille. All sizes are width by height unless otherwise requested. The faceplate will then be larger as stated above. Important: All filter return vents, both standard size and custom size, will take 5 to 8 weeks to be manufactured and shipped. There are rush shipments (2 to 4 weeks) available for an extra charge (please call for information). All decorative air vent covers are special order, non-returnable and cannot be canceled once payment is received. Color sample finishes are available for a small deposit which will be refunded when the samples are returned. Please contact us with any questions. Looking for matching register or standard returns? See all of our Steel Crest products to easily coordinate styles. These decorative return air filter grilles offer a variety of unique designs suitable for any decorating style. Place your order today!